July 19, 2013 This week, Hosni Mubarak’s old media boss, Abdel Latif el-Menawy, published an astonishing essay on the website of the Saudi-funded, Emirati-based satellite television station Al Arabiya. Menawy described a wild conspiracy in which the U.S. ambassador to Egypt, Anne Patterson, directed Muslim Brotherhood snipers to murder Egyptian soldiers. It would be easy to dismiss the ravings of an old Mubarak hand if they were not almost tame compared with the wild rumors and allegations across much of the Egyptian media and public. Even longtime observers of Egyptian rhetoric have been taken aback by the vitriol and sheer lunacy of the current wave of anti-American rhetoric. The streets have been filled with fliers, banners, posters, and graffiti denouncing President Barack Obama for supporting terrorism and featuring Photoshopped images of Obama with a Muslim-y beard or bearing Muslim Brotherhood colors. A big Tahrir Square banner declaring love for the American people alongside hatred for Obama rings somewhat false given the fierce, simultaneous campaign against CNN and American journalists. The rhetoric spans the political spectrum: veteran leftist George Ishaq (Patterson ‘is an evil lady’), the Salafi Front (calling for demonstrations at the U.S. Embassy against foreign interference), the reckless secularist TV host Tawfik Okasha (whipping up xenophobic hatred), leaders of the Tamarod campaign (refusing to meet with Deputy Secretary of State William Burns because the United States ‘supports terrorism’), and Brotherhood leaders (blaming the United States for the military coup). Dr. Lynch’s article conveniently ignores his own role in promoting the Egyptian Muslim Brotherhood to the world as a potentially “moderate” organization, a stance which no doubt helped contribute to the current anger in Egypt over what is perceived to be US support for the Brotherhood. We can first see signs of Dr. Lynch’s promotion of the Brotherhood when in 2005, he posted an article on his blog suggesting that the Muslim Brotherhood could serve as some kind of “firewall” against Al-Qaeda and related groups, a discredited view with a long history which appears to now be at the core of the Obama Administrations stance towards the Global Muslim Brotherhood. I”m just back to the US, and now I can say a bit more about where I was and what I was doing. Some readers might recall that last month I published an essay in Foreign Policy magazine, “How to Talk to America”, cast as a memo to the Supreme Guide of the Muslim Brotherhood Mohammed Mehdi Akef. So last week I flew to Cairo, where I spent four intense days of meetings and discussions with more than 25 people. I got to talk with most of the leadership of the Muslim Brotherhood which isn”t currently in prison, about a dozen Muslim Brotherhood bloggers and activists, a number of Egyptian analysts with keen insight into the Brotherhood such as Diya Rashwan and Khalil el-Anani, and of course the usual journalist suspects (i.e. my friends). As we noted at the time, although Dr. Lynch denied that his visit was “any kind of channel”, there was a very real question as to whether or not Dr Lynch’s trip was in someway endorsed or sponsored by the State Department. In June 2007 The World Tribune, a website known to rely on a network of informants, had reported that the Bush administration was “quietly engaging the Muslim Brotherhood movement” and had “approved a policy that would enable U.S. diplomats to meet and coordinate with Brotherhood leaders in Egypt, Iraq, Syria and other Arab states.” Whether or not his trip was tied to the US government, the GMBDW reads Dr. Lynch’s Foreign Policy magazine article, referred to above, as an attempt to coach the Brotherhood leadership on how to make themselves acceptable to the US and the West. The most controversial part of the appointments is the alleged sidelining of the reformists and especially of those associated with Khairat al-Shater. The imprisoned deputy guide is a wealthy businessman and charismatic reformist with wide support from activist youth, the champion of the reformist trend and widely tipped to be the next Supreme Guide. He was the force behind the English-language Ikhwan Web, and the patron of the MB Blogging movement I profiled last year. I can personally attest to Shater’s interest in opening up channels of communication with the West: he wrote a moving response to my Foreign Policy article, delivered from prison via his daughter, which I did not publish at her request. Shater’s pragmatism and democratic leanings, argues Mahmoud, threatened the old leadership of the MB, which despite its talk of shura did not want to lose its dominant position. April 10, 2013 The deterioration of Egyptian politics has spurred an intense, often vitriolic polarization between Islamists and their rivals that has increasingly spilled over into analytical disputes. Some principled liberals who once supported the Muslim Brotherhood against the Mubarak regime’s repression have recanted. Longtime critics of the Islamists view themselves as vindicated and demand that Americans, including me, apologize for getting the Brotherhood wrong. As one prominent Egyptian blogger recently put it, ‘are you ready to apologize for at least 5 years of promoting the MB as fluffy Democrats to everyone? ARE YOU?’ So, should we apologize? Did we get the Brotherhood wrong? Not really. The academic consensus about the Brotherhood got most of the big things right about that organization … at least as it existed prior to the 2011 Egyptian revolution. U.S. analysists and academics correctly identified the major strands in its ideological development and internal factional struggles, its electoral prowess, its conflicts with al Qaeda and hard-line Salafis, and the tension between its democratic ambitions and its illiberal aspirations. There is good reason to question the use of this methodology in the investigation of organizations with a substantial covert component such as the Muslim Brotherhood. While statements and interviews are important, as Dr. Lynch himself noted, there is the very real possibility that the Brotherhood is engaged in deception operations which cannot be uncovered in this manner. 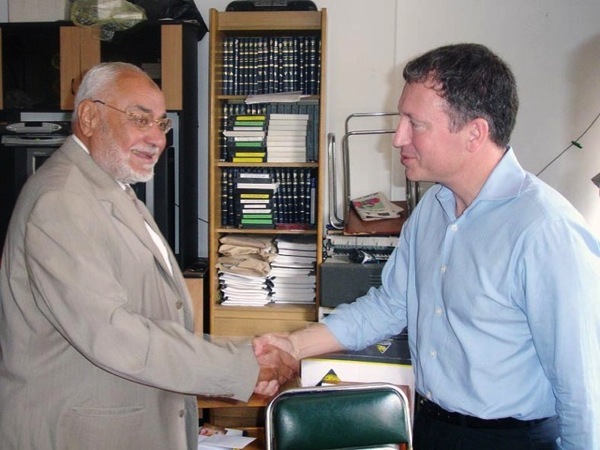 In contrast to this flawed methodology, the GMBDW relies on the full spectrum of sources on the Global Muslim Brotherhood and as long-time readers will confirm, we have long been deeply and profoundly skeptical about the Brotherhood’s commitment to democracy, never consistent with Islamist principles, as well as having documented the extensive history of the Brotherhoods promotion of religious hatred and support for terrorism, facts which Dr. Lynch appears never to have considered. Yet despite the discrepancy between our track record and that of Dr. Lynch concerning the Muslim Brotherhood, there have been reports that he has been awarded a tenured position at George Washington University while the continued existence of the GMBDW is in doubt due to lack of financial support. This is only one part of the sad reality when it comes to the current world of “expertise” on the Muslim Brotherhood.